What makes the shot so stunningly beautiful is that warm amber/orange glow emanating out of the cloud cover. Those nice warm golden/orange tones are appealing for they compliment the idea of a nice, warm day at the beach. 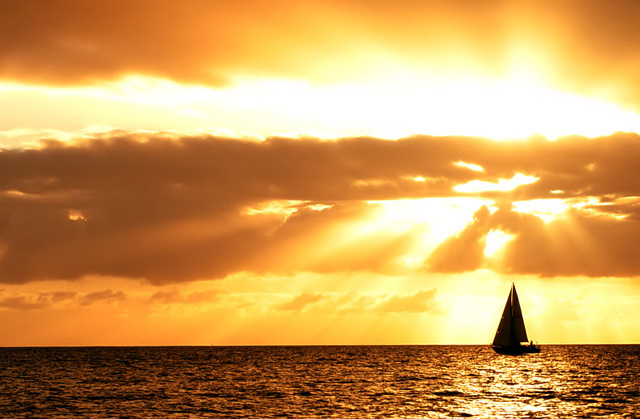 The silhouette of sailboat and the gleams of light playing upon the ocean surface are the two wonderful finishing touches that greatly increases the appeal of this photo composition. Beautifully composed and a lovely capture. 2 and 3 for this?? They must be kidding! Oh yeah - that's one sick sense of humour (get used to it though). This is stunning. bamthirdwheel has been disconnected for fllllooodiing. Impressive shot! The colors and lighting are excellent. Congrats, you deserve it! Wow, what a great shot... Congrats. Til hamingju með rauða borðann! Frábær árangur! Já flott ég var ekki búinn að fatta að þú ert af klakanum til lukku! Red ribbon why? I did never thougt I would score this hige and 50 10's sh**. Thank you all for your wotings and the comments are just grate. This shot certainly deserves a ribbon! Congratulations! As much as I think my photo shouldve won (no bias) I couldnt accept first place with this shot up against mine. Not only is this a brilliant photo is fits the challenge perfectly. To me that counts for a lot. Taking a good photo is a lot easier than taking a great photo that is supposed to convey a message (in this case "All Alone"), and to have that message clearly shown without having to use a title or description to explain it. Long story short you shouldve won.......then me second. Congrats to you on your ribbon, beautiful pic. Blue and red ribbons both go to Iceland wow! Congratulations on the first of hopefully many ribbons! This was an awesome shot that I picked in the top 2 or 3. It is also now my desktop of the moment! Message edited by author 2003-10-29 00:09:41. Wow I am stunned, this is an awesome capture! BEAUTIFUL! Great color and a very striking image. Sailors are often alone and the expanse of empty ocean emphasizes this. The bright, beautiful sky definitely makes this photo convey solitude and the title reinforces this. Simply stunning. I love the shapes and lines of this photo...and the colors!! An outstanding image. The sailboat is perfectly placed. Overexposing the sky works with this image. Beautiful lighting and color treatment. 10+! Stunning color and light! Simply gorgeus! Can't say I'd change a thing...I love it! Nothing more to say, it's a 10. Very nice colors, a mood of awe. This will probably score really well, and it deserves to do so for at least it's visual merit. I'd only challenge you to move further away from cliche. ***as a side note, I rated yours and "Alone no more..." the same, though the images are almost totally different, almost opposites. I'm curious to see how you both place. Wow!! This is a very beautiful shot. Wow! This is a great photo and you did a terrific job with your choice of edits. Good luck. great shot - and take on the category. powerful thought too, nice work. I think this might be the winner!!! Beautiful! I had one similar to this that I took a few days before the challenge began, doggone it! :) I love the colors, and the exposure is just right. Nice work! Okay, STUNNING. That is a beautiful shot. I love the way the ship sort of stands siloetted by the light (I think I misspelled that). bright, brilliant, sun explains the title. This is a magnificent image. Great composition and the light is excellent. Nicely done. Proudly hosted by Sargasso Networks. Current Server Time: 04/20/2019 12:13:56 PM EDT.